Sadly, some of the most magnificent buildings and rooms of the Tudor age have been lost long since; The King’s Privy Gallery at Whitehall is one of those buildings. One of my not-so-guilty pleasures is recreating these lost chambers in my imagination. So, following on from last week’s introduction to Tudor galleries, this week I want to take you on a very specific time travelling journey. We are going back to Whitehall in the mid 1530s, to the heart of Henry VIII’s newly refurbished palace to explore the magnificent King’s Privy Gallery. Are you ready? In 1529, Henry VIII ‘inherited’ his first minister’s Thameside house, York Place. Sited just to the north of Thorney island, and the Palace and Abbey of Westminster, the site gained importance as far back as the twelfth century, when it was owned by an administrator of Henry II. By 1241, the ‘nobile palatium’ was sold to the then Archbishop of York, Walter de Gray. From this point forward, the house became the principal residence of the Archbishop of York in Westminster. Thus, in 1514, Thomas Wolsey took up residence in the palace after his appointment to the See of York. Accounts show that building upon the site began almost immediately, in line with the Cardinal’s plans to construct a palace worthy of his ambitions and status. These contemporary accounts, and the archaeological evidence, suggest that Wolsey was responsible for renovating, if not building, the following: the great hall; the chapel; the Great Wine Cellar (which still survives) with the great watching chamber above it – and the privy kitchens. However, by 1529, Thomas Wolsey’s dreams lay in tatters; deeply embroiled in the failure to secure the king his divorce from Katherine of Aragon, the Cardinal’s downfall came soon thereafter. He was charged with praemunire and all his houses and goods seized; this, of course, included York Place. It was now the property of the Crown. 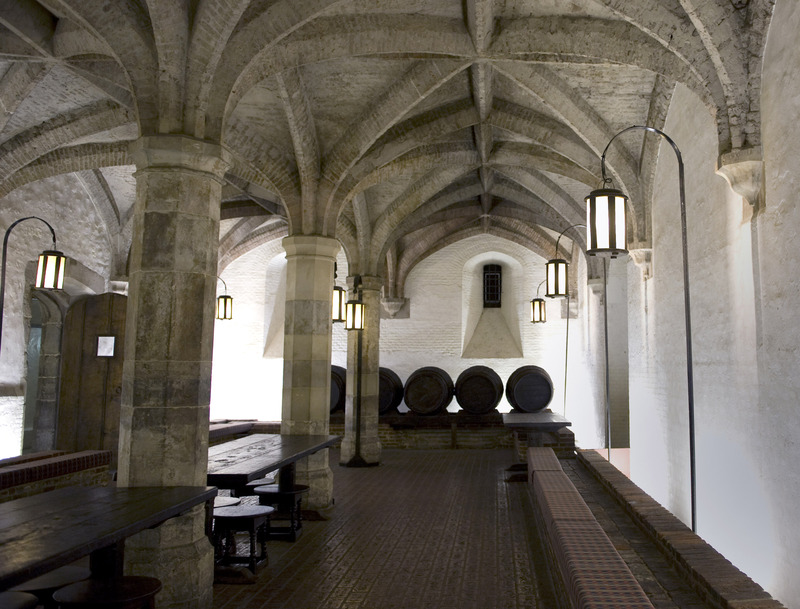 King Henry the VIII’s Wine Cellar underneath the Ministry of Defence Main Building,Whitehall. It is a fine example of a Tudor brick-vaulted roof and is some 70 feet (21.3 m) long and 30 feet (9.1 m) wide. It was the only part of the original Whitehall Palace to survive a disastrous fire in on 4 January 1698. (Image via Wikimedia Commons). We know that in the same year, Henry VIII came to inspect the palace, accompanied by Anne Boleyn and her mother, Elizabeth. Although York Place was already a fine riverside mansion, Henry and Anne had an even grander vision for what later became known as The Palace of Whitehall. The couple would pour over plans together, and one of the first additions to be made was the king’s new, privy gallery. Building began in earnest at York Place in 1531, as the account books testify. Interestingly, the Tudors were masters of recycling; and buildings were no exception. One of the great recycling projects of the age involved the king’s new gallery at York Place. Just prior to his downfall, Wolsey had constructed a gallery at his house in Esher. Henry ordered the timber-framed structure to be dismantled and conveyed to York Place, where it was reassembled. Its length ended up being divided into two by the Holbein Gate, which was also under construction at the same time. And thus part of the Esher gallery sat to the one side of the Holbein gate (the St James’ Park side), overlooking the tiltyard, with the other on the west side running as far as a ‘cross-house’. A close up of the Palace of Westminster from the Agas Map from 1561. In particular, note the King’s Privy Gallery range in the centre and annotated: A= The Holbein Gate traversing King Street; B= the body of the gallery (this part was part of the gallery reconstructed from Esher; C= the cross-house containing the privy stair; D= the part of the gallery containing some of the king’s secret lodgings. The ‘cross-house’, bi-sected the newly built King’s Privy Gallery at right-angles, and contained the privy stair – later known as the ‘The Adam and Eve’ stair. This allowed the king and his honoured guests direct access to the privy garden and garden gallery below. We will take a stroll down those steps in a moment! Beyond this staircase, the building continued, and at this point the gallery also widened as it extended in the same westerly direction to join the main palace building. This part of the gallery contained some of the king’s most secret chambers, including the bedchamber in which Henry died, in January 1547. Together, this entire building became the King’s Privy Gallery at Whitehall. So now let’s time travel and take a stroll together from the western part of the gallery to the east, from the main palace building to towards the leisure complex on the far side of King Street (now Whitehall). Let’s see what we will find! Step into the gallery, it stretches away from you for about 300ft! The walls are covered in oak panelling. Reach out with your right hand and feel the contours of its ridged, linenfold design. Notice how paintings are hung along its length, each covered by a pair of curtains, which can be drawn over the paintings to protect them when they are not being viewed. (See the exhibition at Hever in the Long Gallery to demonstrate how this would have looked). Running around the top of the walls, above the panelling, is an intricate decorative cornice. If you look up even further, allow your breath to be taken away by the beauty of the ceiling; it is decorated in ‘fretwork’ of geometric design but embellished by the royal coat of arms in moulded work, lead balls and oak leaves. Imagine the vivid colours of the painted adornments and the gilding that glows in the morning sunlight. This ceiling is an example of a decorative high-status ceiling of the 1530s. It currently adorns the Wolsey Closet at Hampton Court Palace. Notice the geometric design, the heraldic devices, which in the Whitehall gallery might have looked similar with the king’s coats of arms replacing the the Fleur-de-lys and Tudor roses. Light floods the gallery from [at least] four bay windows; two large, two small. All are carved ornately in timber for, as you will see when you go outside, the structure you are standing in is essentially one made of wood. Each window sports wooden shutters also made of oak panelling. The window nearby is propped open and you can smell the sweet scent of a summer’s day and hear the laughter of ladies drifting up from the courtyard below. As you move along the gallery you feel the thick, rush matting beneath your feet; it has been scented with sweet herbs, such as lavender. You notice the many doors carved in plain or linenfold oak – twenty-six in total – if you were to count them, some leading, you imagine, into the king’s secret chambers which lie off to your left. In sequence these are; the king’s dressing room, the king’s dining room, his bedchamber, and his study / library. All of these are located along the first half of the gallery. This Tudor room shows well certain elements described as decorating the Privy Gallery – wooden panelling (although this is plain and not linenfold) and the decorative cornice, running round the top of the walls just below the ceiling. And then, just beyond the halfway point, the gallery widens at the head of the square -shaped privy stair, which you see descending down to the ground floor. Whilst the gallery itself continues eastward toward the entrance to the Holbein Gate, you are curious to see the garden and the outside of the gallery, so you make your way down the steps. Once down in the garden, you can appreciate the gallery from the outside. It extends along the entire northern side of the privy garden, and is two storeys high. We have already heard how the upper storey of the gallery was timber-framed. However, you now notice how it sits on a brick foundation. The roof is pitched and tiled, and along its length it is ‘garnished’ with the king’s arms and badges and with ‘bullions and buddis of tymbre’, lead leaves and ‘antique work’. Many of these embellishments are either painted in vivid colours of red, blue of white, or gilded so that they glisten in the morning sunshine. The building in the background is thought to represent The Low Gallery at Hampton Court Palace, showing the type of exterior decoration fashionable at the time. Image courtesy of Bridgette Webster. But what is most striking are the patterns decorating the external walls of the gallery. Whilst its timber framing has been left exposed, forming a grid-like pattern, the interior panels are alive with plastered grotesque work, painted in striking black and white. It really is quite a sight to behold! And so our time travel is at an end. We are to leave behind this historic building, which saw the marriage of Henry VIII and Anne Boleyn in one of the upper chambers of the Holbein Gate on 25th January 1533, and the death of the king some 11 years later, in January 1547. The gallery and its rooms would be altered a little over time; the use of the secret chambers evolved and a council chamber would be added but, essentially, it remained the backbone of the palace until the gallery, along with the rest of the palace, was almost entirely destroyed by fire on 4th January 1698. And so, one of the architectural beauties of the Tudor age was irretrievably lost – to live on only in our imagination. You documented the date of Anne and Henry’s wedding incorrectly, she was executed in 1536, they were married in 1533. It was an insightful read, I could really imagine that I was there! It’s such a sadness these great buildings are no longer there for us to see. Oh you are so right! Sorry, slip of the mind. Must have been obsessing about 1536 when I wrote it! Anyway, thank you for the nudge about that and your kind comments. I love it when people really feel transported in time by a piece. It’s one of the best compliments for me – so once again, thank you!